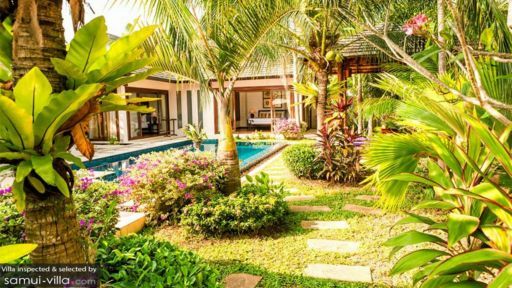 You’ll feel right at home the moment you enter the compound of cosy Villa Baan Kluay Mai; the villa’s lush garden and chic living spaces are a welcome sight. 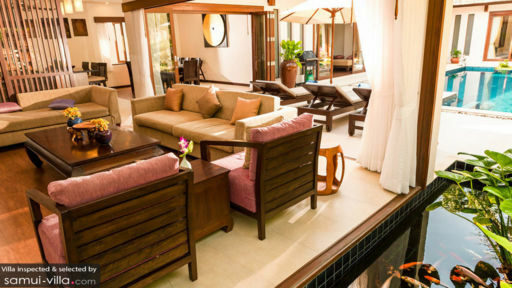 A total of three bedrooms accommodates up to eight guests, making Villa Baan Kluay Mai a great bet for friends and families on a group getaway. Service is impeccable; a housekeeper, chef and services ensure that you won’t have to lift a single finger during your stay. For a change of scenery head out for a game at the golf course, or to spend a relaxing day at one of the island’s pristine white sand beaches. A variety of excellent dining establishments are easily within reach from the villa. Verdant tropical plants, colourful flora and fish ponds beautify the garden at Villa Baan Kluay Mai. The beautiful outdoor compound is a true haven for those who love to bask under the sun with icy cocktails and a spread of goodies. There are many places to choose from, starting from the sparkling swimming pool and pillowy recliners, to the breezy outdoor lounge. Earthy tones and contemporary pieces adorn the living spaces at Villa Baan Kluay Mai. The interiors are kept cool and comfortable with a ceiling fan and air conditioners. Plop down upon the cushy sofa if you’re in the mood for curling up with a good book or catching a snooze. Delicious meals taste even better when you’re in good company, so round up your travelling party for communal meals at the expansive wooden dining table. Your stay at Baan Kluay Mai includes housekeeping service and welcome drinks. Amenities available at additional cost include airport transfers, personal chef service, in-villa massages and child minding services. 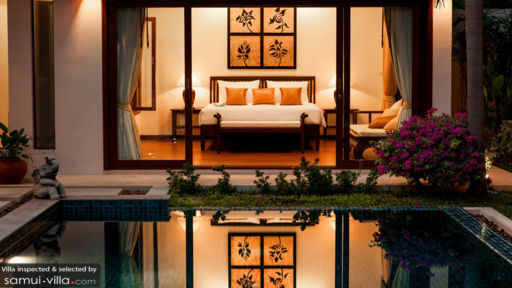 Baan Kluay Mai is located in Hua Thanon, a coastal town in East Samui. The town exudes a quiet, laid back vibe, and doesn’t offer much in terms of travel attractions, apart from a quaint Muslim fishing village. Its serene atmosphere makes it an ideal destination for vacationers seeking to getaway from it all. From your villa, you’re 10 minutes’ drive to Bang Kao Beach and 15 minutes’ drive to Lamai Beach. The former boasts a postcard-perfect setting, yet it’s remote and the sea isn’t suitable for swimming. For a livelier beach ambience, head over to Lamai; it’s the most popular beach on the island after Chaweng, and offers stunning sunset vistas. Dine out at venues like Sweet Sisters Cafe, where you’ll find healthy, organic cafe fare or The Fisherman’s Outlet, which features a wide-ranging menu of Thai and Western fare. Our favourite beachfront restaurants with uninterrupted ocean views are Vitamin Sea Restaurant and Black Pearl Bar & Restaurant. For some of the best desserts on the island, head over to Villa Chocolat, where you’ll find excellent chocolate cakes, pastries and coffee. Try out kiteboarding if you’re in Hua Thanon between the months of October to April. Samahita Retreat, located just 12 minutes’ drive from your villa offers drop-in yoga classes. Hop into a car for a 15 minutes’ drive to Lamai, where you’ll find popular cultural attractions and viewpoints like Hin Ta and Hin Yai, Pagoda Khao Chedi and Lamai Viewpoint.